The race to build the tallest towers is never ending, next to Dubai, China aiming to beat the current tallest Burj Khalifa with its two Phoenix Towers. Source CNN: No one can accuse China of stinting in its efforts to reach for the sky. Less than a year after construction was halted on a world-beating 838-meter tower in Changsa in central China (just days after it began) architects have revealed plans to build something even bigger. At one kilometer (0.6 miles) high, the largest of the two Phoenix Towers planned for Wuhan, the capital of Hubei province in central China, will be the tallest in the world if completed on schedule in 2017/2018. 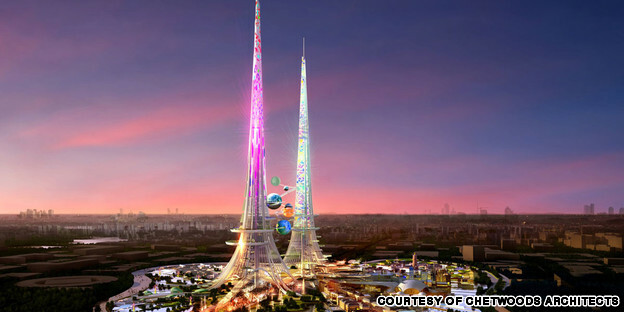 The towers will also be crazily futuristic and super environmentally friendly. And pink "Yes, [they are pink]," Laurie Chetwood of UK-based design firm Chetwoods Architects tells CNN. "They reflect the spectacular colors of the sunsets in the region." Designed to sit on an island in a lake, the largest of the towers will stand 172 meters (564 feet) taller than Burj Khalifa in Dubai. The project is still awaiting government final approval, but if all goes to plan it could steal a march on the Kingdom Tower in Jeddah, Saudi Arabia, which is also designed to top out at one kilometer, but not until 2019. With a 2012 population of 9.7 million, Wuhan is located on the Yangtze River. It's a major transportation hub that's been called "the Chicago of China." Biggest kaleidoscope and floating restaurants "[We were asked] to create an iconic building for Wuhan, which embodied a strong environmental and social content as well as reflecting Chinese tradition," says Chetwood. The design is inspired by dualism in Chinese culture -- the traditional Chinese phoenix symbol of the two birds, "Feng" and "Huang," as well as the idea of yin and yang. Feng Huang, or phoenix, are a pair of mythical birds in Chinese culture traditionally used to denote royalty. 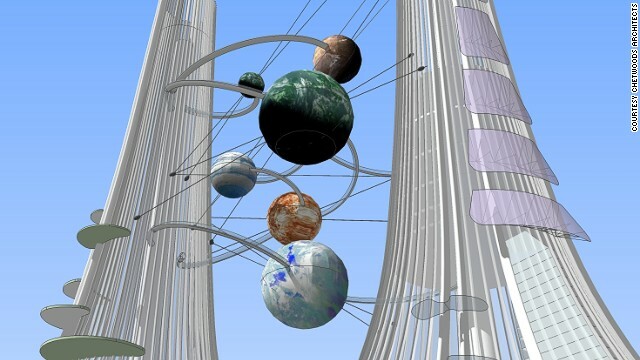 Three large spheres containing celestial-themed restaurants accessible via "skywalks" will be suspended between the two towers. The spheres "represent planets orbiting the Towers," according to the designers. If giant pink towers and celestial spheres aren't gaudy enough, the larger building will have the unlikely boast of housing the world's tallest kaleidoscope driven by a wind turbine. It'll project a psychedelic display for people gazing up from below. A ground-level commercial center looks set to continue China's current obsession with imitating global architectural styles. "You'll have a French street, a Japanese street, a Turkish street and so forth ... to allow people to see the world without necessarily having to leave China," Chetwood told the Guardian. Sci-fi environmental features The towers are designed to have green features such as pollution-absorbing surfaces to filter the city's air as well as technology to aerate and filter the water. Thermal chimneys, suspended air gardens and biomass boilers for waste recycling are also part of the plan. The towers are designed to be able to generate enough power to fulfill their own needs and those of neighboring areas. "The Feng tower uses cutting-edge technology to 'feed' the Huang tower with renewable power in a symbiotic process," the design firm said in a statement. The two towers will cover seven hectares of a 47-hectare site on the island. "It is wonderful to work in China -- the response to new ideas is always enthusiastic and optimistic," says Chetwood. "The chance to develop a unique site -- a large lake in a large city -- provides a wonderful opportunity to create something very special for China."